Creative designs are the prominent focus in the field of Architectural Metals. The designers are artists driven by their imagination and vision. They create eye catching art forms which make the buildings they design become landmarks with distinctive new features inside and out. Stainless steel and Aluminum include many of today’s buildings and the curtain wall design utilizes panels made of various materials. Currently there is a new trend where these panels and interior components have new colors and textures. The color of stainless steel is created by a process known as PVD coating. Physical Vapor Deposition coatings produce thin films and coatings typically for thin mechanical, optical, chemical, or electronic functions. The range of colors of the coating offers new opportunities for designers to express themselves. 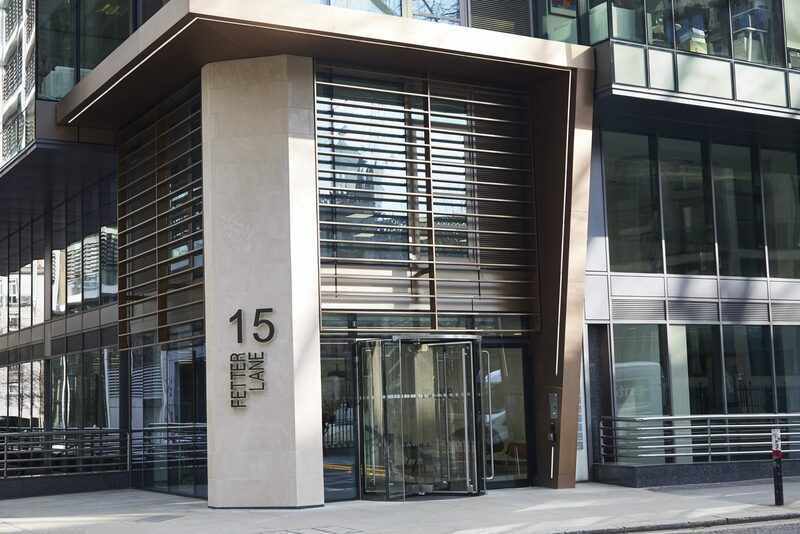 “The original brief was to undertake renovations to dilapidations as the main tenant was moving out of the building,” says Elizabeth Humphries, Associate Director Architecture at McBains. “Then we were asked to provide architectural services to refresh all the internal common parts and a concept design for the external entrance. “The existing entrance was low and dark and not very discernible from the main thoroughfare as the entrance was at the side of the building. The client wanted to create a clear entrance that was welcoming and that had more gravitas and appeal. There were quite a few challenges on the project. Firstly nothing was known about the structure of the façade of the building, as there were no detailed records or drawings. Assumptions were made as to what would be found once the existing façade was stripped off. These assumptions proved entirely false as the slab edge was much further back than assumed. Originally much brighter finishes were proposed, i.e. a powder-coated polyester canopy but the planners were not in favor as there is a listed building opposite and the bright finish was deemed to be unsuitable to be in such close proximity. Alex Pashouros, project manager at John Desmond Ltd, proposed PVD as an alternative this proved more than acceptable as it had both the aesthetic appeal of bronze and also had a twelve-year guarantee which gave us and the client much-needed reassurance. The V-Grooving and folding of the PVD stainless steel sheet would achieve the look of solid bronze without the weight and was approved by the planning council. The building really needed a strong identity as it was dated and lacked visual impact when viewed from the thoroughfare. The design of the brise soleil, canopy and column was developed to create a sense of presence and to bring the building into the 21st century in terms of style and materials. 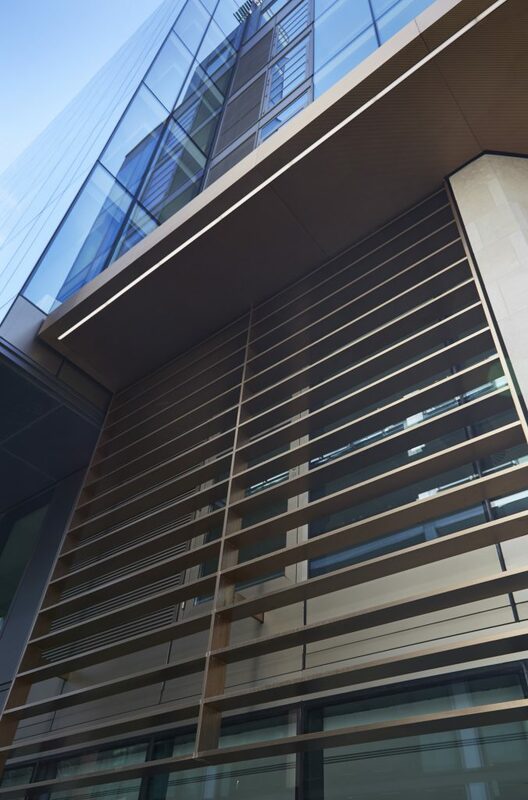 The re-orientation of the entrance to Fetter Lane and away from the side again gives the building greater appeal and is much more inviting. The original specification for the brise soleil fins was for solid stainless steel bar so it was clear that the architect wanted the substantial look that of solid material. The issues with using solid stainless steel were that it would have been very heavy to hang from the canopy and the fins would have deflected under their own weight. As this would have still needed to be clad to achieve the bronze look it would have been an expensive exercise in terms of achieving the finish and attaching such a weighty structure to the building. The solution that Pashouros and the John Desmond Limited team felt was both cost-effective and aesthetically a perfect match was to fabricate the brise soleil, canopy and column from PVD colored stainless steel. This would then be V grooved and folded to appear as solid material. The technology behind V Groovers enables sheet metal to be formed with a sharp outside corner on the bend. Early versions of V Groovers had a limited capacity and most were capable of only 3 or 4mm thickness and most frequently they grooved thin decorative stainless steel. Some V Groovers are in fact modified planers, while some are like routers. V grooving is also processed on milling machines. Typically, a V groove is machined on the inside of the bend line and when the metal was bent along that line a sharp corner is achieved. This sharp corner is required by architectural designers who want buildings to have a distinctive, high quality look and precision fit. The design’s overall focus is on visual appeal, and not related to structural strengths. 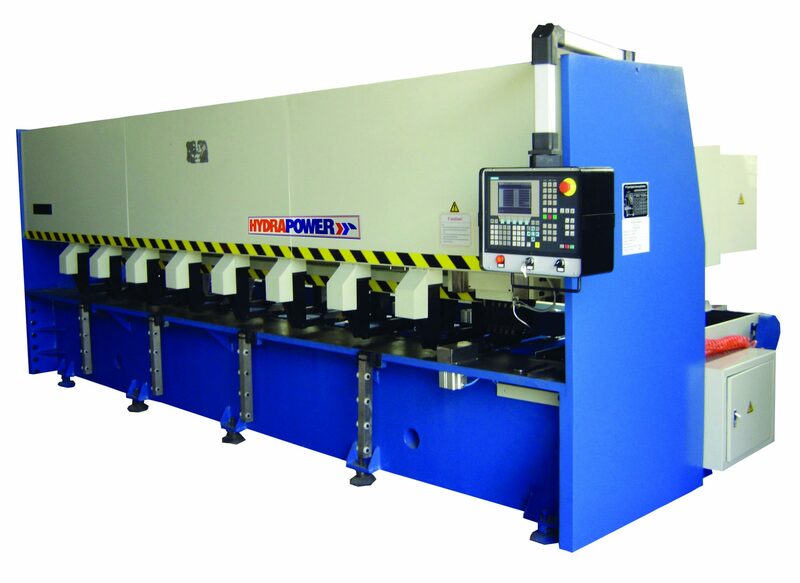 The early designed machines continue to offer the limited capacity and performances but Hydrapower International, Inc. embarked on a five year product development mission. The Florida based manufacturer of bending, shearing, pole manufacturing, punching, and cutting solutions, advanced grooving technology to meet the increasing demands of architectural designers. Hydrapower’s Groovers can accommodate sheets up to ½” thick and 20′ long. A V Groover can finish a 10′ x 0.045″ deep groove in 16 gauge stainless steel in about five seconds. A complete panel with four grooves at 10′ long will be processed in a cycle time of about one minute. With Hydrapower’s software, a “pause” function can be activated to automatically bring the sheet to the front where the clamps will release and the operator can turn it 90 degrees to run grooves in the perpendicular direction. This feature is also used when a sheet is grooved on both sides. There were challenges on the project as the John Desmond team couldn’t have free access as the remaining tenant had sensitive legal documentations in its care. All work had to be carried out from the outside of the building other than two weekends, and their normal access to the building interior was via scaffolding that was wrapped around the outside. With such restricted timescales and access it was essential that whilst on-site all construction work proceeded smoothly and without any delays. The architect’s design enabled the canopy to be made off-site. The cladding was clipped on using bespoke clips in the workshop and then dismantled into as few sections as possible. This process meant that all the clips and sections were in the right places and the on-site process was greatly simplified. A hoist on site was to lift each section into position however its weight restriction was 250kg. The canopy structure was transported to site in 26 sections each weighing 150kg. The brise soleil was built to its full height of four meters in the workshop, then dismantled and taken to site. The verticals were solid with aluminum inserts clad in the PVD sheet. The fins were created from the PVD sheet and strengthened with stainless steel ribs which were bonded on together with the end caps. The column, however was six meters high so had to be built in two sections. It was laid down on its back and the whole column clad in the workshop before being dismantled and taken to site. For the brise soleil, canopy and column 45 sheets of 2.4 by 1.2m 316 1.5mm stainless steel were used with the sheets coloured through the PVD process and then embossed. Fabrication time was four weeks and the installation time eight weeks. There are around 4000 Hydrapower machines in use throughout the world and rarely will you find a used machine for sale. Since 1972, Hydrapower has invested in engineering and customer service. All of their machines are built to quality standards much higher than ISO-9000 requirements and always have been. John Desmond Ltd is a designer, fabricator and installer of specialist architectural metalwork. 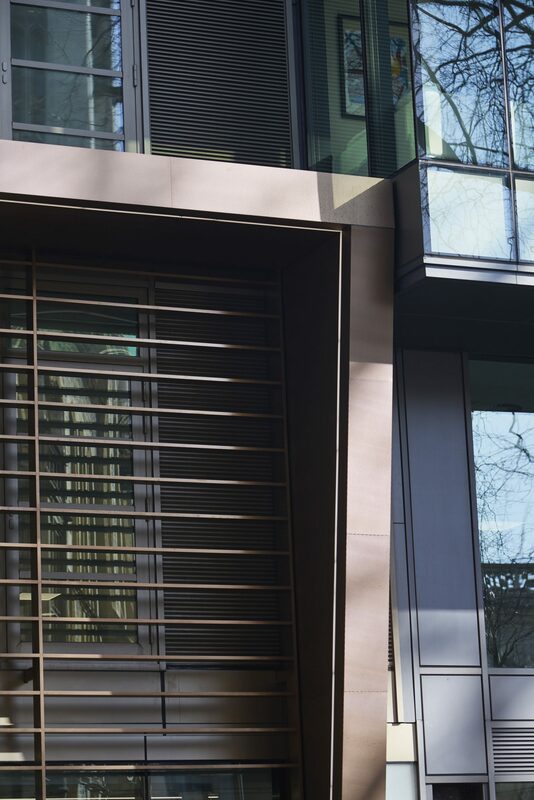 They work on projects where exceptionally high standards of architectural detailing are critical and are proud to have successfully developed working relationships with architects, designers and other contractors over our 46 years of trading.